Dow Jones Utility Index: A Defensive Play Or Weather Related? The Dow Jones Utility Index (DJU) closed just below key “cross” trend resistance at 508, accompanied by a set of indicators that suggest a “break” to the upside is likely to occur sometime soon. 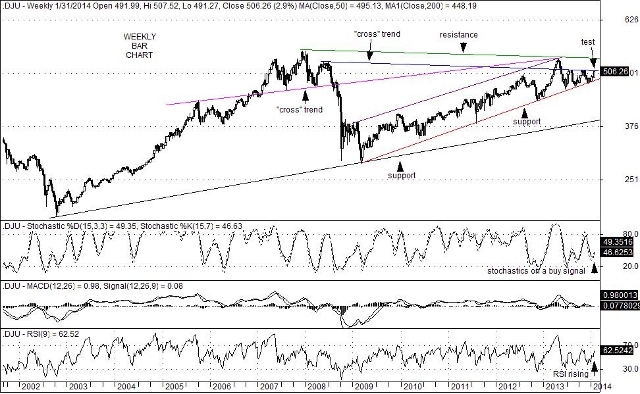 Technical oscillators on weekly charts are all aligned bullishly at the moment including: stochastic, RSI (Relative Strength Indicator), and MACD (Moving Average Convergence-Divergence) studies. Clearly, weather related conditions are pushing the demand for power to near-record levels this winter, which points to an increase in top-line revenue growth for utility companies. That said, the demand for energy sources to fuel electric power as well as heat for homes and businesses is also on the upswing which could result is subdued profit margins. Nevertheless, the recent setback in the S&P 500 and Dow Jones Industrial Average has shifted investor attention back toward fixed income securities and dividend paying stocks as a defensive measure. Those would include telecom stocks like AT&T (T, 5.50%) and Verizon (VZ, 4.40%) as well as utility shares that traditionally pay higher dividend yields. Those would include names like Southern Company (SO, 4.90%), Exelon (EXC, 4.30%), Duke Energy Corporation (DUK, 4.40%), Consolidated Edison, Inc. (ED, 4.60%) and American Electric Power Co., Inc. (AEP, 4.10%). Technically, if the Dow Jones Utility Index were to break above key resistance at the 508 level, an extension up to a test of long-term trend line resistance currently at 535 could emerge. A break above 535, however, would likely result as a byproduct of a stepped up run-to-safety maneuver if the decline in the broader markets were to intensify. You are currently browsing the Charted Territories blog archives for February, 2014.